The Matsuzaki Daruma is designed with a double Sasaba blade meaning both blades are tapered or shaped like a bamboo leaf. This will give greater power when point cutting. Edge is a pure convex Hamaguri the very best and sharpest when it comes to slide cutting. 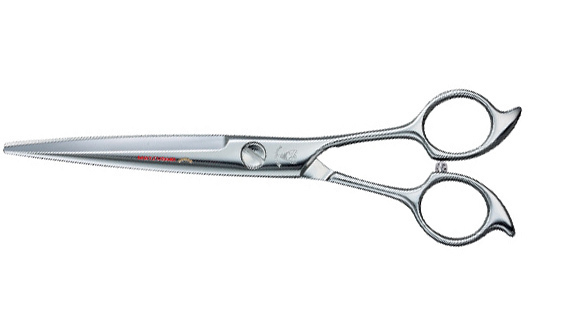 This allows stylist to cut thicker sections when less effort, and less thumb pressure, less fatigue. Wider Sasaba blades allows for effortless slide cutting, and extra weight of shear is balanced perfectly so shear is easy to control. High grade Cobalt Alloy steel, shear is highly recommended. You will receive excellent performance from this shear. It is suitable for sliding cut. Scissors can be used in reverse. Both use of thinning blades as inactive or active to make outer curved or inner curved hairs cutting. Cut scissors such as Sasaba, Daruma, Circle, Reversible etc., can give different feeling of cutting sharpness when used in reverse. Multi layer of the shape of half clam. This is art craft of multi layer of steel, an excellent all handmade article. Edge line of a blade is more rounded than standard, which makes hairs slide to the tip of blades. We call such a blade SASABA ( like a bamboo leaf ). There are two types of SASABA scissors, single and double SASABA.